Beautiful old-fashioned rocker toys. 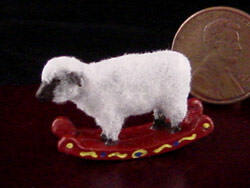 These metal sheep dolls are exquisitely handpainted, with flocked coats. 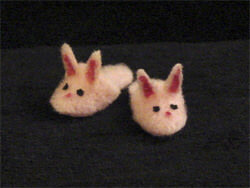 1¼" (3cm) long and &frac78;" (2cm) tall. 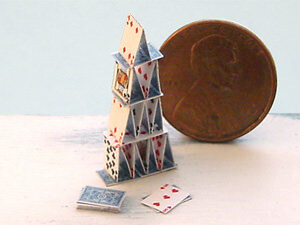 This little house of cards is constructed from 27 individual tiny playing cards. 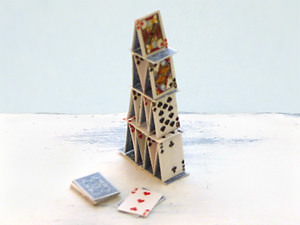 It is assembled just like a real card house, except for the glue, which would be cheating in real life, of course. 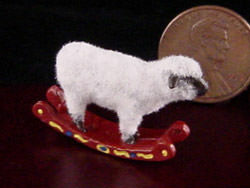 A truly unique miniature for your dollhouse! 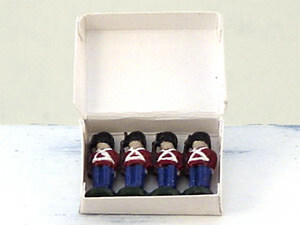 A charming set of old-fashioned toy soldiers. 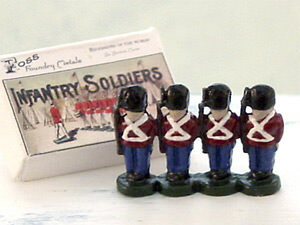 The tiny metal soldiers are handpainted and come in their own box. I designed the box lid using antique artwork. The 4-soldier unit measures 9/16" (14mm) tall and ¾" (20mm) across. 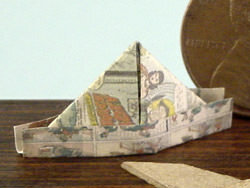 Classic childhood entertainment, playing Pirates with homemade newspaper hats and cardboard swords. 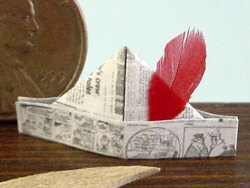 This adorable handmade set includes two hats—one made from a page of color comics, and the other from a black-&-white daily with a jaunty red feather in the brim—and two cardboard swords. From 1930 to 1942, children across America were glued to their radios each afternoon following the adventures of Annie and her friends. 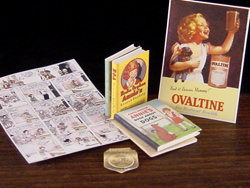 This miniature set includes Secret Society Manuals, Ovaltine premiums, Sunday comics, and best of all—a 1936 ROA Secret Decoder Badge with a dial that really spins! 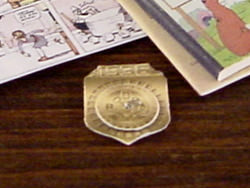 The badge is barely over ¼" wide—you'll need a magnifying glass and sharp eyes to read it. 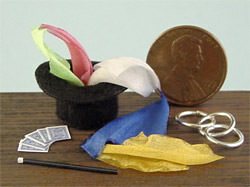 This is a miniature collection you'll find nowhere else! 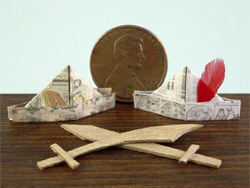 All 4 books have blank pages and measure 11/16" to ¾" tall (17 to 19mm).